There is no doubt that the Lamborghini Countach changed Lamborghini’s image forever. The Countach put Lamborghini in an exclusive class of high-end, rare automobiles. By 1985, the company needed to design a brand new vehicle. The problem they faced was that this vehicle had to be even more desirable than the Countach. Lamborghini executives turned to the same man who designed the Countach, world-renowned auto designer, Marcello Gandini. Gandini was well-known for designing head turning vehicles (Gandini designed both the Miura and Countach for Lamborghini). Gandini did indeed have a bunch of prototypes that could have become the next vehicle for Lamborghini. Eventually, he decided to use the Cizeta-Moroder V16T. This vehicle was created by a group of ex-Lamborghini executives in the late 1980s. Gandini firmly believed that it was the correct decision for the company. But before the final decision could be made Gandini faced a prodigious predicament. In 1987, Lamborghini was no longer owned or managed by its original Italian founders. Chrysler had purchased the company and the executives at the company were dissatisfied with Gandini's overall design. The original prototype that Gandini proposed was drastically redesigned by a group of Chrysler auto engineers and designers. The new design allowed the vehicle to been seen as more “aerodynamic” and had more “ground hugging details”. Gandini was disappointed with the design, but he was later credited with creating the vehicle (his signature is on the side of the vehicle). A final decision was made and the vehicle was named the “Diablo”. It was named after a bull who fought in the battle of “El Chiccoro” in 1869. The Diablo was presented to the public on January 21, 1990. The vehicle had some modified features such as are intakes that were neatly incorporated into the lines, this is what the Countach lacked and was greatly criticized for. The vehicle also had a better rear view, more interior room, and electric components, another feature that the Countach completely lacked. The power plant consisted of a 485 horsepower V12 Lamborghini engine. The engine allowed the Diablo to become the first Lamborghini to exceed the 200 m.p.h. milestone. The car was not cheap, priced at a staggering $250,000 (when it was first introduced in 1990). The vehicle also offered some upgrades such as a rear bumper with an integrated spoiler which kept the engine compartment cool. This upgrade would cost around $5,000. Then there was the optional factory fitted luggage which would run the owner $3,000 and a Breguet clock on the dashboard for about $11,000. The original Diablo was later succeeded by a handful of modified Diablos, which extended the life of the vehicle's production. The vehicle was manufactured between 1990 and 2001. The Diablo VT was introduced in 1993. The VT differed from the standard Diablo in a few ways, by far the most notable change was the upgrade to all-wheel-drive compared to the orignal rear-wheel-drive. The Diablo SE30 was introduced in 1994. The vehicle had an upgraded engine which boosted the horsepower from 485 to 523 horsepower. The car also was lighter, had anti-roll bars, and was a limited-production model commemorating the company's 30th anniversary. Only 150 SE30s were produced. A year later the Diablo SV was introduced. This vehicle received another boost in horsepower this time to 529 horsepower. A year later, yet another Diablo was created, the Diablo VT Roadster. It was introduced in December 1995 and featured an electrically operated Targa roof. Lastly, the Diablo VTTT (Vicious Traction Twin Turbo) was created in the late 1990s. This vehicle was simply a monster! The engine consisted of a 12 cylinder, 650 horsepower power plant that had three levels of turbocharge boost. The 650 horsepower engine allowed the VTTT to claim a top speed of 222 m.p.h. However, it was never tested with the turbochargers fully turned on. The turbochargers would boost the engine to a mind-numbing 750 horsepower. The VTTT was considered to be the best Diablo of them all by many car enthusiasts. Mind you, it only cost an astounding $500,000. The company later produced a few different modified Diablos designed strictly for racing proposes. In all, 2884 Diablos were produced. 900 of them were the original Diablo and the others were different variants of the vehicle. There is not doubt that the Diablo was light-years ahead of its time and was a major asset to the Lamborghini brand. Most car aficionados believe the Diablo was an automobile which was just as good as the Ferrari F40, others claim that it was even better! Only in my dreams! What a gorgeous hunk of machinery! Thumbin'! 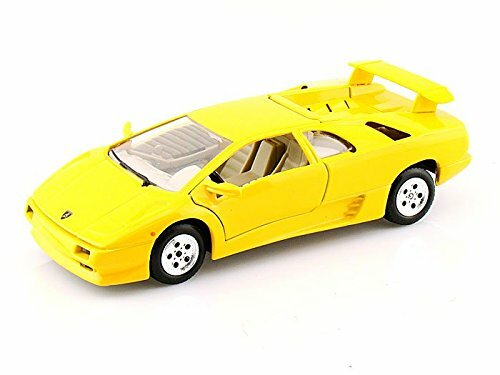 There is somethings very 1980s about a Lamborghini. I mean that in a good way.